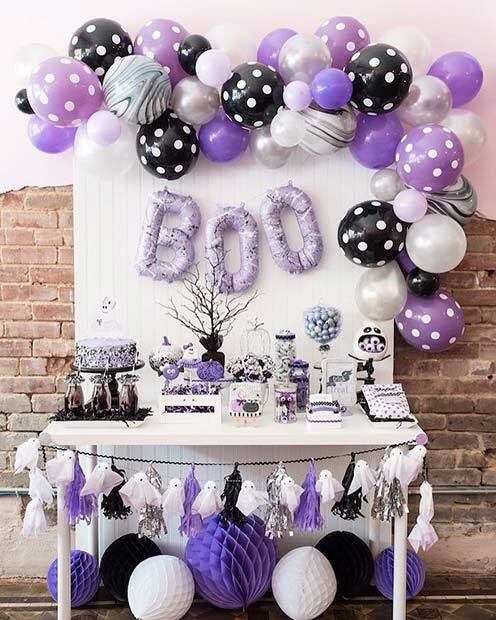 If you are planning a baby shower that will take place in the late fall, why not have a Halloween theme?! You can celebrate both occasions in one and it will be a baby shower to remember. We love this unique idea and think you will too. 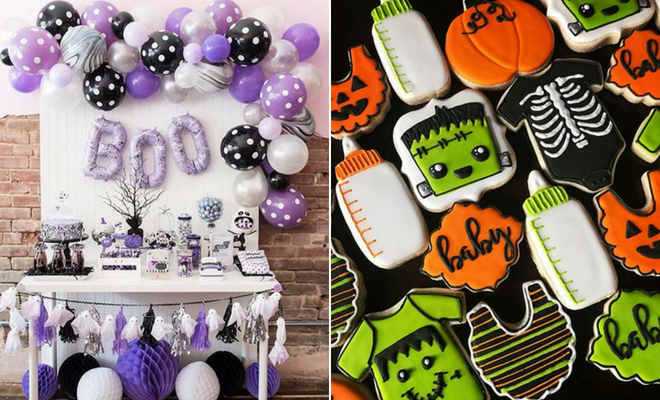 So, we have put together 21 of the best Halloween baby shower ideas. We have cakes, decor ideas, games and more. Take a look, there is a spooktacular idea for everyone! The first idea we have to show you is this Halloween baby bump cake. 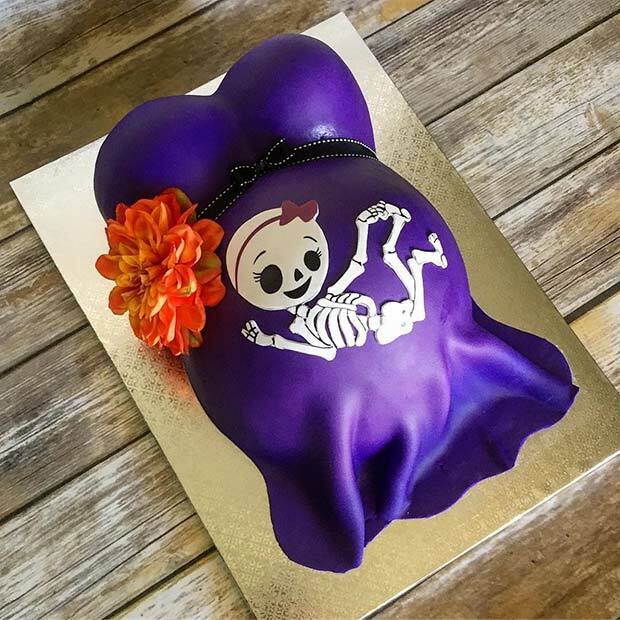 Baby bump cakes are very popular at baby showers and this one has had a Halloween twist. 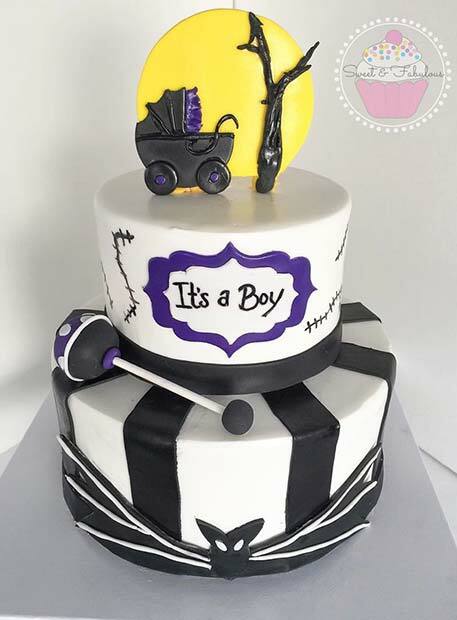 The cake features a cute skeleton baby over the bump. It is a creative cake, perfect for Halloween. Cakes like these can be made in any flavor and with any design. 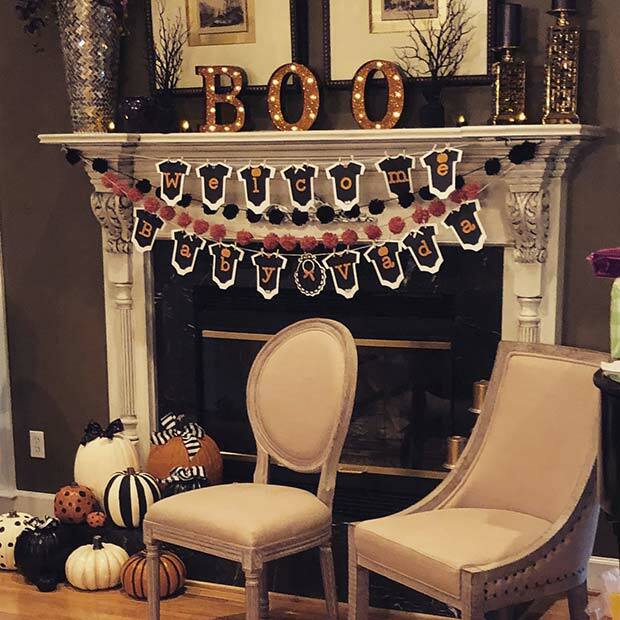 The decor ideas for a Halloween baby shower are endless. You can have any decor from spooky to chic like this one. This idea is like Halloween and glam mixed together. You have the classic pumpkins with added painted pumpkins. The boo sign and banners are also cute. Take inspiration from this to celebrate in spine-chilling style. Many parents-to-be choose to share the gender of their baby with everyone at baby showers or gender reveal parties. If you are choosing to do this at Halloween, you could use a pumpkin like this. 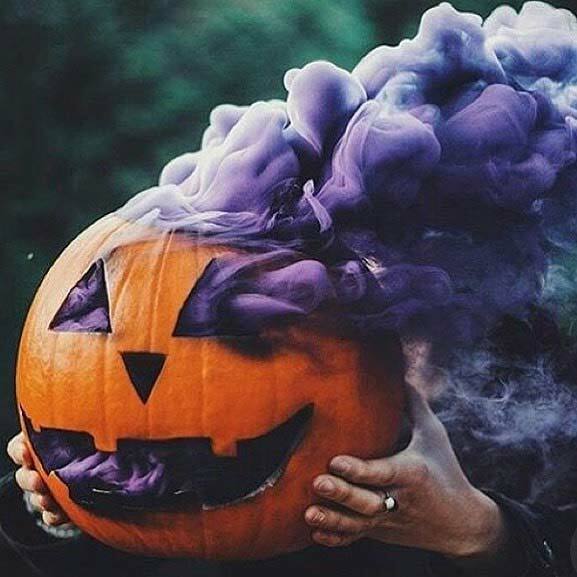 The pumpkin has been carved with a traditional face and has purple smoke coming out of it. For your baby shower, you could have pink or blue smoke. 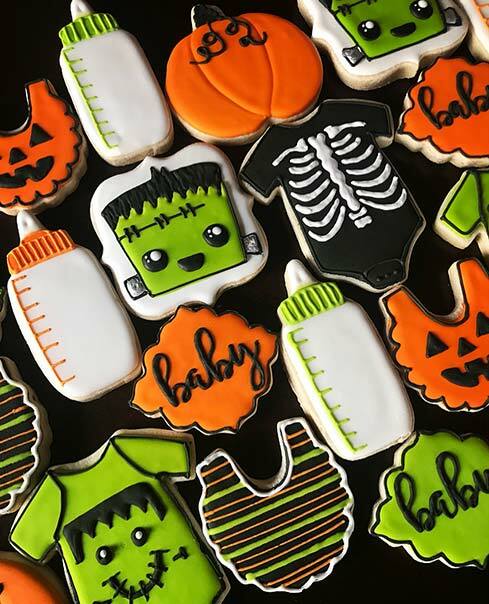 Every baby shower needs sweet treats and our next pick is spooktacular. Here we have Halloween inspired cookies. These feature pumpkins, baby Frankenstein, pumpkin bibs and more. Every guest would love to eat one of these. Bake your own if you like baking or buy similar ones. Next, we have a super cute decor idea. Here we have three pumpkins that represent the family. 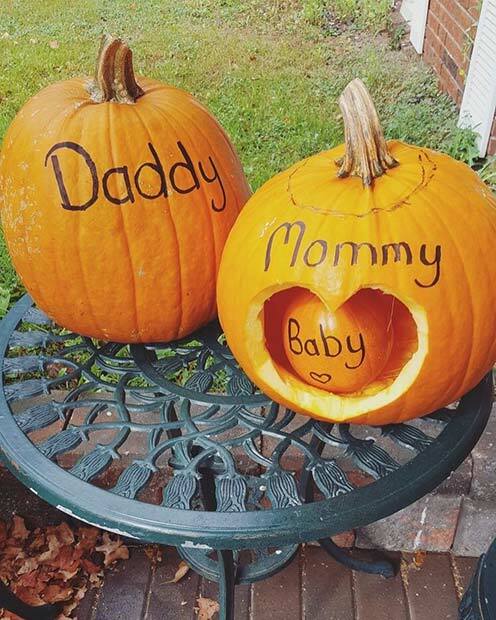 The large pumpkin has daddy wrote on it, the next one says mommy and the smallest pumpkin has baby wrote on it. This idea is easy to recreate and will look great. If you have a bigger family, add more pumpkins. 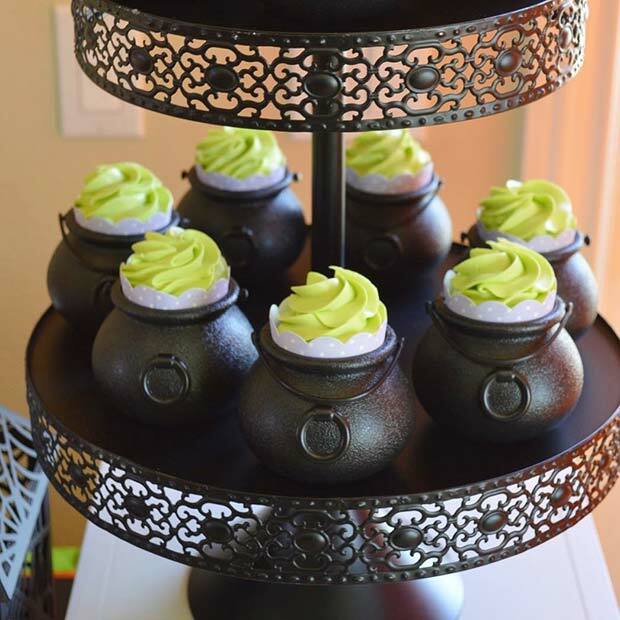 Our next idea are these adorable cauldron cakes. For these, small cakes have been placed inside small cauldrons. You can bake any flavor cakes and decorate them however you like. Little cauldrons like these can be bought online. You can serve these on a buffet table or give them out as party favors. Here we have another decor idea. This one is super cute and has a purple, black and white color scheme. We love this because it is beautiful and perfect for Halloween. There are ghosts and a boo sign, as well as Halloween inspired treats. Recreate something like this or put your own style into it, maybe change the colors but have similar decorations. A fun activity you can have at your baby shower is a photo booth. Photo booths allow guests to take photos and you can even have props like wigs. 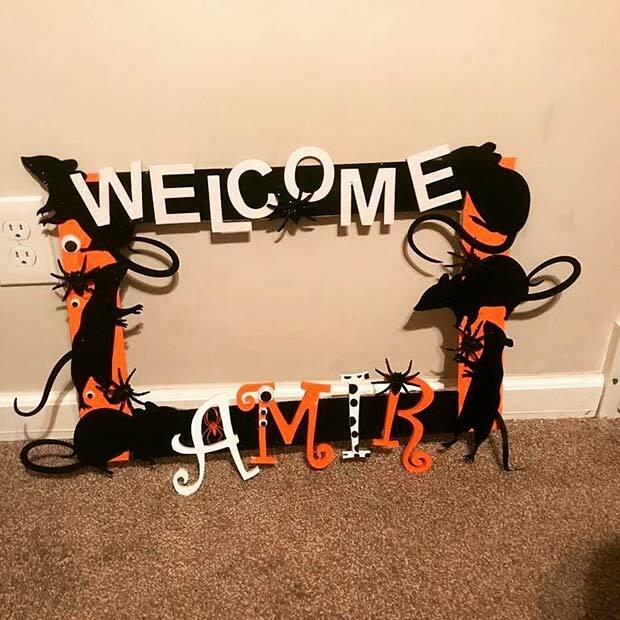 For a photo booth you will need a frame, and this one is perfect for a Halloween baby shower. It has spiders, rats and more. If you have a name for the baby, you can have a welcome sign like this one. The photos can be kept as a memory and the baby will be able to look at them one day. The Nightmare Before Christmas is a classic Halloween movie so it is no surprise it has made an appearance in this list. Here we have a baby shower cake inspired by the movie. It has the classic black and white stripes, moon and more. A cake like this is a must-have for any fan! Bring some humor to the baby shower with a baby pumpkin like this. 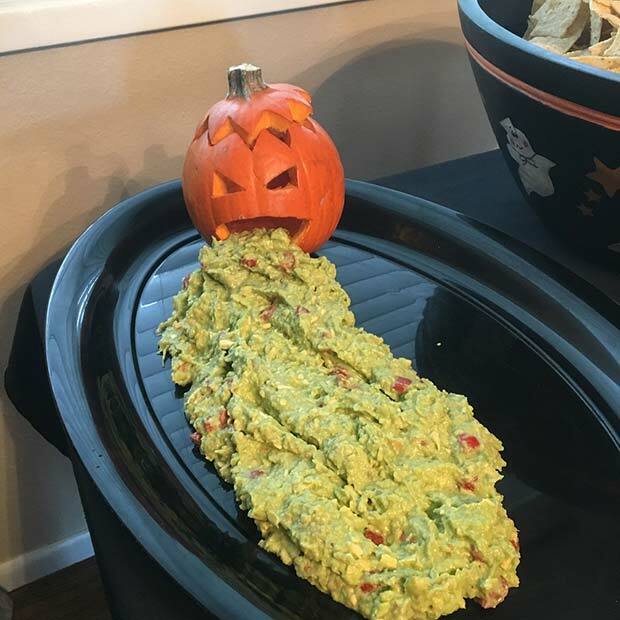 The baby pumpkin has a traditional carved face and is being sick guacamole. This is quite funny because all parents know that babies can be sick quite a lot! You can serve other dips but the green guacamole will look the best.